Welcome to Kalorama Information’s Point of Care Testing page! You’ll find all the information you need concerning the Point of Care Testing industry through our market research reports, blog posts, press releases, videos, and multimedia, consolidated for your convenience. Point of care (POC) tests are performed outside central laboratories and produce quick results. POC has been an important goal in IVD (in vitro diagnostics), and new developments have made achieving it possible. Point of care testing is transforming, thanks to innovations in smartphones, biosensors, lab-on-a-chip, and wearable devices. For healthcare professionals, having an expedited diagnosis is of paramount concern. Point of care diagnostics will be part of a paradigm shift from curative medicine to predictive, personalize, and preemptive medicine. POC testing has migrated from the hospital to different medical environments over the years. Thanks to the introduction of transportable, portable, and handheld instruments, point of care testing exists in the workplace, at home, within disaster care and, most recently, convenience clinics. Kalorama Information’s report,Point of Care Diagnostics Market and Market Share Analysis, finds that Globally, millions of dollars are spent annually on POC diagnostic testing, both professional testing and self-testing. In 2016, sales of POC testing reached $18.4 billion, increasing 3.8% from $17 billion in 2014. A major contributing factor to slower growth was pricing strategies that continued to discount the cost of POC diagnostic testing in some segments and higher cost in other segments of testing. 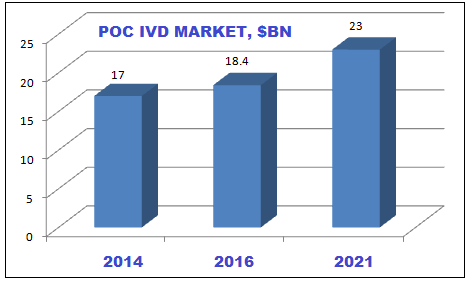 In 2021, the total global POC diagnostic testing market is expected to reach $23 billion, displaying growth of 4.6% over the forecast period 2016-2021. Immunoassays – testing antibody responses in specific patient samples – are useful in POC testing in two main areas. Fertility tests and infectious disease tests comprise 45% of the total POC/rapid test immunoassay market, covered in Kalorama Information’s Immunoassay Markets report. POC testing allows physicians to quickly make decisions and begin treatment. Point of care improvies clinical care and increases throughput, benefiting both patients and clinical facilities. Point of care simplifies procedures fewer (often automated) steps. There is little need to aliquot specimens or store and transport samples, reducing the potential for contamination or deterioration. There is little need to aliquot specimens or store and transport samples, reducing the potential for contamination or deterioration. Testing devices have been designed for point of care with reduced footprints and ability to analyze a larger range of biomarkers, making them more flexible than machinery in the central laboratory. Portability and versatility have expanded POC testing’s capability; diagnoses are conducted in less traditional places, such as lower income areas and under-served populations, rural region, and areas with limited infrastructure. Dexcom Dominant brand in continous glucose monitoring. Siemens Healthineers, a major participant in POC testing for blood and electrolytes, rapid coagulation, rapid cardiac markers, drugs of abuse and urinalysis tests. Abbott a recent merger with Alere improved their position significantly in infectious disease, added to its successful iStat line. Roche the #1 company in IVD is a dominant company in areas of POC, including the blood glucose market and the coagulation market. Ascensia Diabetes Care another glucose monitoring leader. Beckman Coulter a leader in blood and electrolytes testing, colon cancer screening/FOB testing, infectious disease and cancer testing markets. John Petersen of the University of Texas reports that handheld glucose meters are incomparable to full lab sugar tests, despite portability and user-friendliness. These potentially minor variations can severely impact patients who are on strict glucose control plans. The Mayo Clinic’s Paula J Santrach reports that there are multiple methods of performing the same tests, and lack of standardization can lead to incosistent results. She warned that, despite a test’s simplicity, data management and oversight is complex, requiring training and proper competency assessments for potentially hundreds of people in a single system. Clinical Laboratory Improvement Amendments (CLIA)-waived tests, by definition, have limited ranges of values relative to full laboratory tests, a troublesome fact considering accuracy is more important than speed. Mangion expressed concern that clinicians may use point of care testing as a screening tool, rather than for on-site diagnosis, leading to more comprehensive tests ordered. Point-of-care carries a question of efficacy, and opinions vary contingent upon the application for which they are used. A 2015 British study published in the Emergency Medicine Journal reports that blood gas analyzer tests used for measuring calcium and electrolytes can reliably replace centralized lab tests so that clinicians receive results in less time. The Centers for Disease Control (CDC) recommend caution when using CLIA-waived rapid diagnostic tests for influenza, as presentations of false positives or negatives depends upon the test’s sensitivity, specificity and level of patient influenza activity. To maximize test efficacy, clinicians must collect specimens as close to the onset of symptom presentation as possible. In-depth Industry Coverage with links to Kalorama’s press releases, and industry sources.